The original Zagg keyboard case for iPad got great reviews and when the iPad 2 was released Zagg joined forces with Logitech to market a very similar keyboard case. Not that easy to find in the UK I bought the case direct from the Logitech website for £90 which is quite expensive. The case arrived fine in a few days from Amsterdam. It is made of aluminium but not quite the high quality grade that the ipad itself is. As you can see from the photo below, it doubles as a case and adds amazingly little thickness to the already thin iPad2. 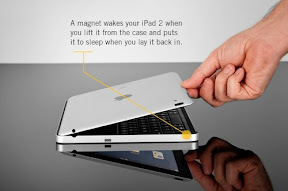 The case has the same magnet wake up trick that the official smart cases have. The screen is pretty well protected and the keyboard is recessed enough and has padding to ensure it doesn't damage the screen which is well protected in transit. The case doesn't protect the back of the iPad at all. The keyboard itself is more the size of a netbook, pretty much the same size as the Asus Transformer. They give better feedback than the Transformer keys and the keyboard is nice to type on, if a little on the noisy side! The original Zagg case got some criticism for having a flimsy "hinge" on the back that helped to hold up the iPad. This has gone and the iPad now just slots into the keyboard with nothing to support it at the back. It can be used in either portrait or landscape orientation but is more stable in landscape. You can't adjust the angle of the screen but it was sensible for day to day use and I found myself using it as a stand as well for example to watch videos. You really need to use the keyboard on a solid and flat surface like a table. It doesn't work well on a lap or arm of a chair but on an office table or aircraft style table on a train or plane it is pretty stable but I did manage to knock it flying when the table it was on got knocked so you need to take some care with it. It actually worked better on the train as the top of the ipad rested on the seat back in front. 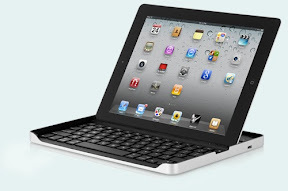 It is actually a Bluetooth keyboard and needs to be paired on first use with the iPad. It has a built in battery that apparently lasts a few weeks and thankfully charges from a standard MicroUSB cable. They keyboard has connected flawlessly to the iPad and has an on/off switch backed up with auto power off if the keyboard isn't used for a bit. There are some issues with keyboards in general with iOS and many applications like the browser don't let you use cursor keys for advantage. There is no mouse pointer (or track pad) unlike the Asus Transformer for example. For emails, blogging and note taking in meetings it works well. And these are the three things I want to use my iPad for the most! I do wish it was a little bit more stable though and it was quite expensive. It's looks complement the iPad well though and it is about as slim a keyboard solution as you can imagine. And importantly the keyboard itself is fine to type on and yes I did type this review using it!